A not-so-long time ago, a brown haired, blue-eyed little girl saw New York City for the first time. She came out of the tunnel that brought her from Pennsylvania to this new land, stepped out onto the glittering pavement and stopped. Now, 15 years later, that same starry-eyed young woman still feels the urge to dance in the streets and thank her lucky stars that they aligned so she can have a New York, NY address. There are moments when I’m doing everyday, ordinary things, and I feel such an immense amount of love and thankfulness in my soul that I literally swell. My New York story is one that’s like many other hopeful artists who grace the streets with only high-heeled bootstraps and raw ambition to be their guide. I’m not alone –there are endless writers, musicians, models, actresses, dancers, and performers who move to Gotham knowing that all they ever wanted will reveal itself before their eyes. The universe, surely, will move and shift to make fate play its magic cards. This city has been a large portion of my focus, who I am (and who I will be), and what gives me encouragement for so long. I sincerely cannot imagine my life without it –especially now that I’ve had a taste of how much it feels like home. And if this blog, this experience, this journey and multi-step program is about being honest with myself –I’ve got to be open about everything that New York means to me. I didn’t move here in a relationship. I didn’t move here tied down to anyone or anything or any flame. I didn’t move here with hesitation or thoughts of failure. I didn’t move here thinking returning to NC was an option. But I did move here to build my career. To work for a magazine. To be a voice for women everywhere. To learn the street personally. To meet friends I will have for the rest of my life. To explore everything that the city embodies. And to fall magically, perfectly, idealistically, and incredibly in love. Not a big surprise, I know – but I’ve been trying to tell myself that I moved here only for my career. But that’s a lie. And this journey is teaching me to stop lying to myself. To stop ignoring how I feel or how I react or the thoughts and language I use to speak to myself. I’ve dreamt of working for a magazine since I got my first column job at 15 with The Clay County Progress (titled ‘TLC: Thoughts, Lessons, and Creations from a Teen”). And of course, I’ve known I wanted to live in New York. Thus, I knew that if Manhattan was my place, my very first one true love – my very last love must be here. Right? As I’ve admitted earlier, I thought I would move to NYC and instantly find Mr. Right. I never listened to anyone when they said dating would be hard (or rather impossible in this city) or that it would take time. I just believed it would be simple and right there just waiting for 5’3”-me to step on solid ground. Obviously, that hasn’t happened and I’m not losing hope of it. But I’m also not focusing on it. I’m trying so hard not to make “finding love” or “meeting the right man” at the top of my priority list or the greatest source of my disappointment or sadness. I’m believing in myself (and in my higher power) and surrendering away the thoughts that hold me back. And I think telling myself that part of New York’s draw is the fact that I hope to find love (it’s by far, not the biggest attraction for me), and the NYC-happiness recipe wouldn’t taste correctly without that desire. I still have moments when I cry. I still have moments when I’m down or get discouraged or feel ugly or not worthy. I still have moments where I’m jealous or I reach out and seek attention for the sake of the flattery. I still have moments where things that should be inspiring, are painful. 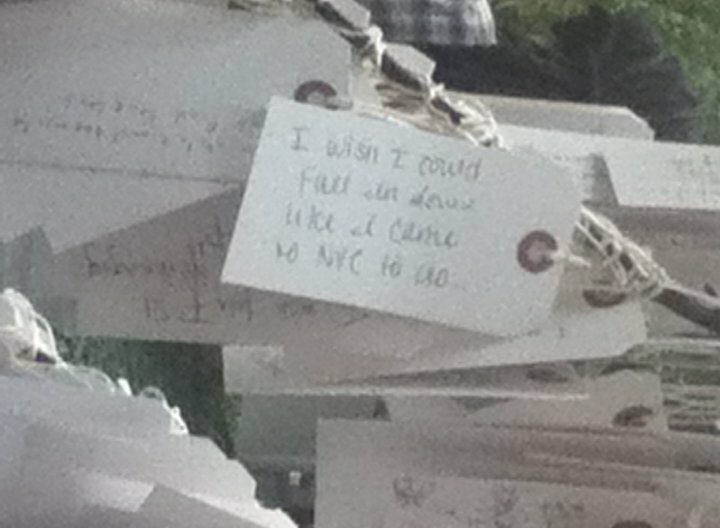 Like when my friend R, full of excitement for seeing the city for the first time (as I remember all too fondly) showed me a picture from The Wish Tree at the MoMA. 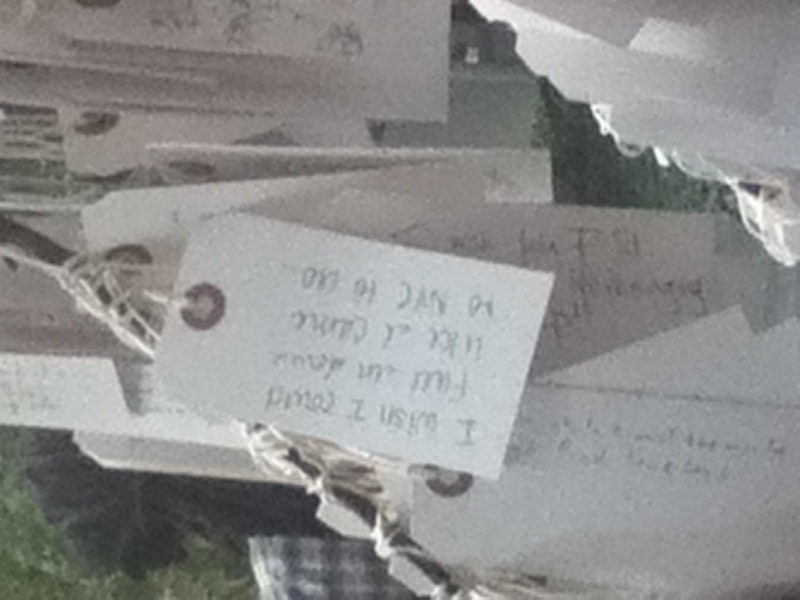 It’s a place where you can place your most coveted wish on a tree with hundreds of other wishes of people who pass by. The wishes make the tree grow and give it the nourishment it needs to keep spreading its limbs. It’s truly a beautiful idea. Maybe that should have made me feel less alone or supported or that there are other people who feel the same way I do. Maybe it should have given me some hope. But, it made my heart sink. It sunk so hardly and so deeply that I about lost my breath. It reminded me of part of the reason I moved to New York – a reason I had been avoiding admitting. It reminded me of the dozens of images and dreams I have stored away in my head (and clipped out of magazines stored under my bed) of what romance I want to experience on this island. It is hard. It’s not always funny or empowering or hopeful. There are these moments where even the city who always make you feel brand new – can’t take away the longing. Or even a blog that I love to write so much. But, if I can move to a New York and find a job and an apartment in three weeks, and still maintain a constant glow for the city – I bet I’m capable of just about anything. And one day, I’ll make the shoe fit on my single self (without someone’s help), and I’ll have that contentment I keep wishing to find. But sorry, Prince Charming – I’m won’t lose a shoe at some enchanted castle tucked away behind Fifth Avenue –so you’ll have to find me in another way. This entry was posted in Step 3 and tagged belief, Fashion, Fifth Avenue, Life, Love, MoMA, New York City, NYC, Prince charming, Shoe, shoes, Wish. Bookmark the permalink. I just stumbled across your blog today. Great writing! I’m envious of you moving to NY. I always wanted to, but I never got up the courage. Thank you so much! I love your blog too!! Especially your list! Lindsay, this is truly a beautiful post! I pictured that little girl who saw NYC for the first time at 8 years old who said “i’m going to live here someday” and you did! YOu made your dream come true and you are an inspiration for women everywhere! I just stumbled across your blog today and I’m so glad I did! I’m truly a simple girl from Pennsylvania with a firey desire to move to NYC. I tell everyone. I just hope I have the balls to do it like you did. Oh girl, you will! Just doing it is half the battle. The rest is easy!